New York City–based kitchen and bath specialists look to industry events, outings, and educational opportunities that cover emerging trends, products, and ideas to keep them current in the most competitive design market in the U.S. Toward that goal, the NKBA Manhattan Chapter devotes itself to providing its members with valuable experiences that foster professional development and long-lasting, quality relationships within the kitchen and bath community, since its charter in 1999. Click here to visit the NKBA Manhattan website. 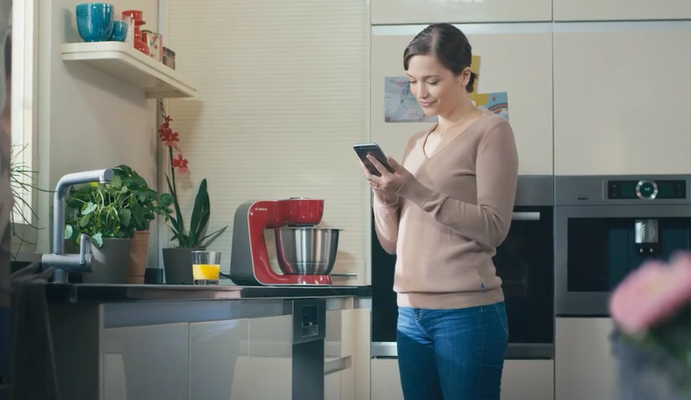 Explore the Connected Kitchen and its relationship to the luxury interiors market, learn about ecosystems and their importance, and enjoy a live demonstration of Home Connect products and partner integration. Presented by the Living in Place Institute. Followed by a panel discussion featuring John O’Meara, Maria Stapperfenne & Dawn DeLuca. An interactive conversation-based presentation of highlights from KBIS. KBIS is, of course, all about products and innovations but it is also about thought leadership with important takeaways for audiences at the KBIS NeXT Stage and the Design Milk X Modenus Lounge. Veronika will review key trends that were identified by Modenus’ team of 24 Designhounds as well as key discussion topics and resources from the stage and lounge including Design Business 101 (Blogging and Affiliate Marketing); Global/Remote Design and Good X Home, a new Modenus platform that supports wellness and sustainability in design. Meet world-reknowned designer Victoria Hagan at the Miele Experience Center. Mingle with friends while enjoying cocktails and hors d’oeuvres. Thank you to our hosts, Architectural Digest and Miele. Join your colleagues for Kitchens that Nourish the Soul—The Feng Shui Way. Presented by Julie Schuster, CLIPP, Principal, Julie Schuster Design Studio. Julie holds a B.S. in Business, as well as a degree in Interior Design from New York School for Interior Design and a degree in Feng Shui from Metropolitan Institute for Interior Design, a Gold Level program endorsed by The International Feng Shui Guild. It’s finally here, what you’ve been waiting for all year! The Summer Social, our chapter’s highly popular annual event to celebrate summer and the kitchen and bath industry we love. Mingle and enjoy delicious refreshments and cocktails at the showrooms of our hosts, TOTO and HAFELE. Join your chapter members and colleagues for a morning tour of the beautiful 2017 Kips Bay Decorator Show House while enjoying light bites, graciously hosted by MIELE. Attendees are eligible to earn .1 CEU at this chapter meeting. Why is this kitchen different from all other kitchens? Join NKBA member, owner of Regency Designs & Interiors, Rochelle Kalisch, CKD, to discuss preparing the Kosher Kitchen for the most challenging holiday on the Jewish calendar: Passover! The “wise” student will learn to tell the difference between products and preparations that are merely Kosher and those that are Kosher for Passover. The “wicked” student will learn not to ask for ham on matzoh at Bubbe’s house. And the student “who does not know the questions to ask” will learn how to prepare their kitchen in 50 square feet, what types of china, linen and glassware to use; and how to make a reservation at a Passover Hotel to avoid the tumult! Join colleagues and friends for this festive gathering to cap off the year! Enjoy friends, refreshments and networking at the show during this festive cocktail hour hosted by MTI Baths. You must also register for the show. Join colleagues at this fun and entertaining event as you learn all about the creative trends in food, cocktails, tablescapes and floral arrangements for your next holiday celebration. Presented by Brian Quinn Events, hosted by Fisher & Paykel. Join colleagues for an inside look at developments and innovations in plumbing at the American Standard, DXV & Grohe Research and Development Center. Participants earn .1 CEU. This presentation will help understand the demographics behind the Micro living trend and the challenges of designing in a small footprint. It will give awareness of all the design elements required to create a successful living environment. It will make us understand the economics of micro/mutifunctional living. Attendees will earn .1 CEU. Sponsored by Richelieu. Hosted by AKDO. Join colleagues from the NKBA, IFDA and IDS for the annual Summer Social, generously hosted by our sponsor Thermador. Earn .1 CEU. Dinner will be served. Raffle for Pet Prizes. Kips Bay Breakfast at the Kips Bay Decorator Show House sponsored by Miele. Members: Enjoy a relaxed evening of networking and socializing as you catch up with colleagues at one of the most beautiful venus in the super-hot Flatiron neighborhood. Cash bar, treats are on us, and do bring your business cards. Please join us for the March chapter meeting, “The Technical Aspects of Lighting & The Design Aspects of Lighting.” Professionals will earn 0.2 CEUs during this presentation by experts from Ayre Lighting at the beautiful Grande Central Showroom and enjoy refreshments and networking with colleagues. 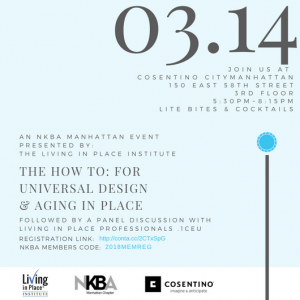 Please join us for a festive evening and 0.1 CEU-credited panel discussion, Designing Dream Kitchens, featuring design specialists Robert Bakes, Bakes & Kropp; Joy Young, Townhouse Kitchens; Dave Burcher, InHouse Kitchen Bath Home and NKBA Manhattan VP of Professional Development; Alexi Knight, Korts & Knight, and moderator Kent Brasloff, NKBA Manhattan Chapter Immediate Past President. Please make plans to join the NKBA Manhattan Chapter for the first chapter meeting of 2016. Enjoy Spanish wine and treats while catching up with friends, and earn the first CEU of the year. This course explores a cutting-edge surfacing technology, ultracompact surfacing. You will gain insight into how this surfacing material possesses the same characteristics of natural stone while providing unmatched color and design flexibility.